The people who are much into the world of fashion have always been noticed including the animal prints either to their clothes or some of their accessories. The passion for latest trends in people always shows up in their dressing sense. 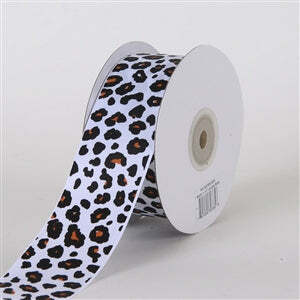 BB Crafts provides the most fabulous grosgrain leopard print ribbons that can be used for various purposes like making accessories, embellishing dresses, headbands and even for wrapping the gift boxes to make them look magnetizing to the receiver. These cute ribbons can even be used for in-house party decorations. By this, you can actually make the entire space to give the appearance of being perked up. Grosgrain is a fabric that holds dull appearance, but it is incredibly strong, as it is a closely-woven and firm fabric. We provide the finest quality of grosgrain leopard print ribbons at nominal rates and in a variety of shades such as white, baby maize, burgundy, turquoise, orange, light pink, royal blue, hot pink, red and purple. All these shades are easily available in different widths and lengths, so you can these in accordance with your need and convenience.